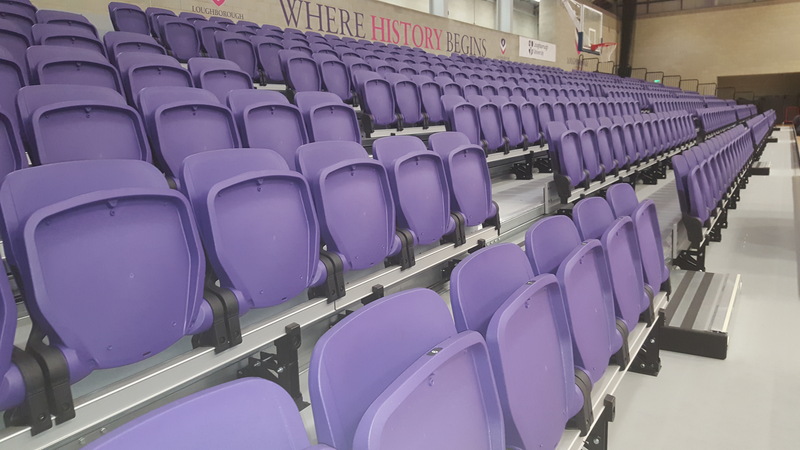 The Sir David Wallace Sports Hall is the largest multi-sports and event space at the 483-acre Loughborough University campus. Named after a British physicist and academic, he was the Vice-Chancellor of Loughborough University from 1994 to 2005. The Sports Hall is widely used for Athletic Union Club training and is a venue for International competitions. 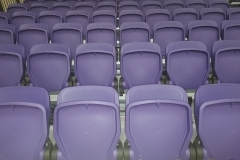 As part of a wider refurbishment project, the University wanted new Retractable Seating units that would meet their increasing capacity demands. 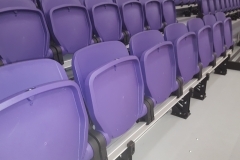 After a detailed tender process including sample presentation, Hussey Seatway were the successful contractor awarded to supply tiered seating that would accommodate in excess of 1500 spectators. Due to the number of different sporting events hosted at the facility a flexible seating arrangement was crucial. 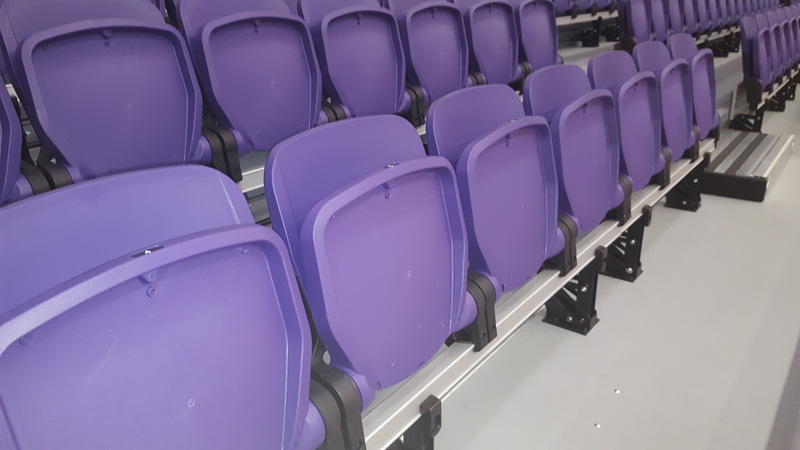 We supplied a wall attached retractable system fitted with 812 Centura polymer chairs these were manufactured in purple, one of the universities team colours. The system was fitted with integral power and automatic railings ensuring fast turn-around time for the end user. 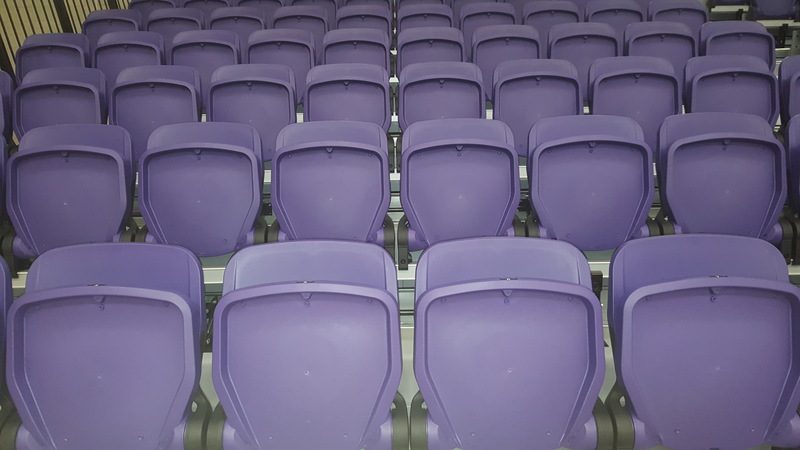 An additional 6 mobile retractable seating units were installed, these are designed to be used and stored at any location within the hall. 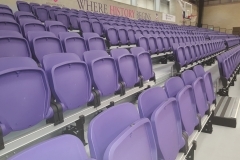 A total of 732 Courtside benches were fitted to these providing a robust and economical seating solution.